Two years ago, I tried dyeing eggs naturally. I had experience coloring wool with natural dyes with much success, so I was not worried about the eggs. Unfortunately, our naturally colored eggs were a disaster full of disappointment. 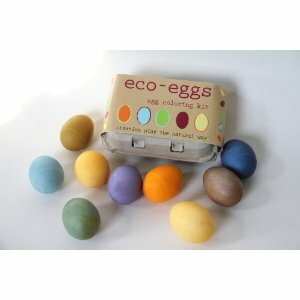 This year, I am excited to try the Eco-Eggs Easter Egg Coloring Kit by Eco-Kids. I respect Eco-Kids as a company. They are a family-run business that inspires safe, creative play. I trust the company’s ethics; I trust the company’s ingredients. I trust these natural dyes will work much better than my experiment! Food coloring used traditionally for egg dyeing is made from artificial ingredients. Food colorings have been linked to ADHD, amongst other suspected problems for our youngsters. I remember cracking open eggs as a child and seeing the white had been dyed as well as the shell. We once bought commercial dyes for Easter just so my daughter could have the experience, but we composted all of the eggs. We wouldn’t let her eat them. We didn’t want her exposed to any chemicals. We have purchased [amazon_link id=”B001EQ5BXA” target=”_blank” ]natural food coloring[/amazon_link] at the local coop, but it was really expensive so we save it for decorating cakes and cookies. I would hate to waste it on hard-boiled eggs. I will update this post after we dye our eggs closer to the spring holiday with the Eco-Eggs Easter Egg Coloring Kit, but I wanted to inform of you of this option early so you can prepare for an easy natural Easter egg dyeing experience. « Want your kid to go to sleep? Cut out TV time before bed.